To all my readers and friends…. May we see some real progress in 2006… A year of Peace and Justice for all. Once again the Supreme Court of Israel has issued a shameful decision. This time, by the President of the Court. A druglord, the biggest one here, will not be extradited to the United States to serve a prison term for crimes committed there. The U.S. i s quite pleased with the decision, it saves them money. So…. a Jew can commit a crime in the U.S.A…. run to Israel and be ‘punished’ here for the crime. Yet a Palestinian that was forced to leave his home and land cannot return to it? Something seems wrong here…. What is the law of return? Is it for criminals or could/should it be extended to people that were legitimately displaced when the State was created? It’s time for the Supreme Court to map out the real priorities of the day. Sharon’s new Party , Kadima, is now speculating on who will be on their ‘list’. I know that they are already on ‘my list’ of people NOT TO VOTE FOR…. I just hope that others will follow. Nearly 60 years after the fact justice,in a small way, will finally be served. The man is 85 years old today. Are we to pity him? Are we to be lenient? Was he when he murdered the Jews in the camp he was a guard at? There are those, including the Supreme Court of Israel, that had reasonable doubt that he was Ivan the terrible. Doubt that he is responsible for the death of hundreds of Jewish inmates. Even if he is responsible for the death of one, he must be punished regardless of his age. Millions cry out from their graves to punish those that killed them… there is enough evidence that he, John Demjanjuk, is one of those murderers. Hopefully his native Ukraine will carry out the ‘final’ justice in his case. SUPPORT NEEDED FOR A PEACE CANDIDATE IN BROOKLYN, N.Y. I just received this e mail from a dear friend… I feel it is important enough to share with all of my readers… Please support this man in any way that you can. I have a good friend, Chris Owens, who would like to become a member of Congress and I am trying to help him. In Brooklyn’s 11th District, the election that counts will take place on September 12, 2006. I am supporting Chris because I believe that he will provide new and energetic leadership in the House of Representatives while continuing the important progressive work started by his father, Congressman Major Owens. We need more candidates like Chris Owens. The next financial filing deadline for Chris Owens’ campaign committee is December 31st. I am asking you to go on-line right now and make a contribution at http://www.voteowens.com or send a check today to Chris Owens for Congress, 328 Flatbush Avenue, #333, Brooklyn, NY 11238-4302. – Community activist, author and lecturer Paul Robeson, Jr. If you are interested in hosting or co-hosting a fundraising event, please send an email to support@voteowens.com right away. If you can volunteer some time to work on a project, your assistance is welcomed. Send an email to volunteer@voteowens.com or go online to http://www.voteowens.com and sign up there. But let me mention this one mo’ time! The next financial filing deadline for Chris Owens’ campaign committee is December 31st and the campaign has almost hit its goal of $100,000. Please go on-line right now to http://www.voteowens.com and make a contribution, or send a check before December 31st to Chris Owens for Congress, 328 Flatbush Avenue, #333, Brooklyn, NY 11238-4302. Comments Off on SUPPORT NEEDED FOR A PEACE CANDIDATE IN BROOKLYN, N.Y. The State of Israel is shirking its responsibility to Arab students in annexed East Jerusalem. Citizens there have the status of Permanent Resident since the Six Day War. The young people living there are subject to Israel’s compulsory education law, but the government is doing little or nothing to guarantee these children an education. Today, tens of thousands of children are subject to the Israel’s compulsory education law, but are discriminated against when it comes to allocating budgets for infrastructure and developing educational institutions. The years of neglect have turned the education system in East Jerusalem into the worst in the country: Dropout rates are the highest and the schools have the lowest percentage of students taking matriculation exams. Click on link above to view the entire article. Again….. Shame on you Israel!! 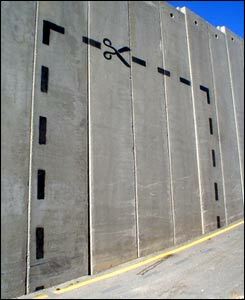 The Latin Patriarch of Jerusalem, Michel Sabbah, said the wall has turned the West Bank town of Bethlehem into a prison. Yet he struck an optimistic tone in his message at the traditional midnight Mass. I for one do not share his optimism. 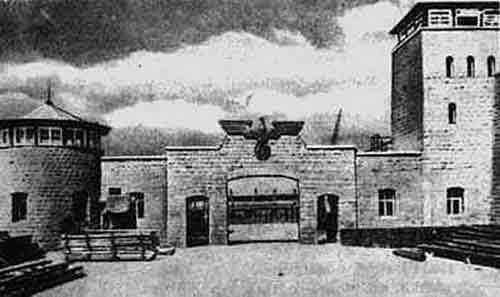 When the walls were built in Poland, the Jews cried out to the world for help.Most perished, some survived. Out of the ashes that remained a new state was created. Today history repeats itself. Israel has not built ovens, has not ordered mass executions, but has done everything in its power to dehumanise the Palestinian people. The world is watching, the world is waiting, it is no longer the 1940’s. No one will be able to say “we didn’t know what was happening”. Don’t let it get that far. The ‘Right’ has always been ‘wrong’ when it came to tolerance. Tolerance of minorities in general, but tolerance of peoples’ sexual orientation in particular. Now, with the new phenomenon of the right turning left, attitudes change as well. With all the national problems facing our nation, perhaps the press could be capable of finding new ways to bring Israelis and Palestinians together instead of finding issues that are of little concern to most people. It didn’t take long for the new ‘lefties’ in Sharons new Kadima Party to show their true colours. Instead of initiating ways of strenghening or revitalising the Peace Process, they are advocating new ways of killing Palestinians. The man in question is supposedly one of the ‘best’, so imagine what the worst ones are thinking. Defense against an enemy is one thing, but creating enemies is another thing completely. Israeli settlers are not satisfied just by confiscating land that does not belong to them….. now olive trees have to be destroyed as well. These same settlers cry out to American Jews to send money to ‘make the desert bloom’… now that it is blooming, what do they do? Next year when the price of olive oil skyrockets who will be the first to complain? What will they use to light their Chanukah lights with? We await the new miracle of Chanukah, the miracle of seeing Israelis and Palestinians living side by side in eternal peace. What a heritage we have in store for the generations to come! Winters in the desert are pretty mild, sometimes even non-existant. This year, we enjoyed summer weather until about a month ago… it was unbelievable. But, it looks like that will all come to an end tonight…. 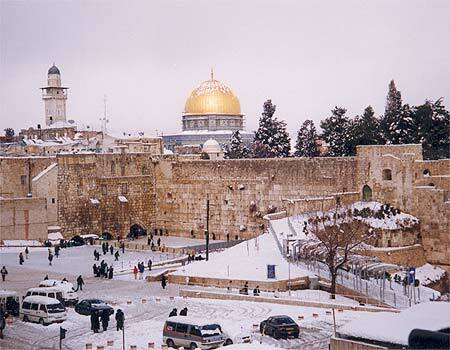 snow is predicted in Jerusalem. The last ‘real’ snowfall we had was three years ago…. so the youngsters are really excited about this special treat…. just in time for Chanukah… all schools will be closed for the entire week. Yes, Israelis have the right to protest. But, we do not have a constitution in Israel like most civilised countries have, so, the government has the right to beat protesters. Such was the case earlier today when scores of Israelis, Palestinians and foreigners banded together to protest the expansion of the apartheid wall being built by Israel. When will they learn that these types of structures eventually are torn down by the forces of progress and peace? Can’t they see what was done in other parts of the world? South Africa is one of Israels biggest trade partners, can’t they trade ideas from them as well? Can’t they see that apartheid does not/ cannot last? Bob Dylan had the answer…. ‘The answer my friends is blowin in the wind’! Can’t they feel that wind? Even just a breeze?? Just where is an extreme rightwinger supposed to run if he wishes to be a candidate? What party should be home to these outcasts of society? Likud is the answer. BUT…. the new leader of Likud seems threatened by the likes of these creatures. Where else can they go? The Kahana Chi (Judeo nazi party) has been outlawed, Sharon is now a ‘leftwinger’ heading a new ‘left’ party… this leaves only Likud. C’mon Bibi…. be fair! Open your arms to your fellow outcasts. They can’t do any more harm to the country than you already are. Israel’s latest violation of the Oslo Accords is the not allowing of Palestinians to vote in East Jerusalem in the PA election. If only foreign powers were able to dictate to Israel itself what parties can run in our own elections. Elimination of such forces, banning the candidacies of Kahana’s followers would be a welcome move to most Israelis. But, these things are not done. Outsiders do not meddle in the internal affairs of other countries. Why then does Israel think it has this right? It is just wrong!! A man who dosn’t know up from down, right from left, is now an international advisor on health. Instead of doing excercises to strengthen the powers of his own defunct brain, he is giving out advice to others. Yes, Sharon is overweight. Yes, Sharon works too hard. His cumpulsive hatred for the Palestinians has kept him at his desk 24/7. His passion for power has kept him munching away to the point of total obesity. Was this the cause of his stroke? Probably…. Dubya…. Mind your own business! If he wants to kill himself, that’s his right! It might be the best thing he can do for this country. Not a soul was surprised at the outcome of the Likud Primaries… Binyamin Netanyahu is the new leader. He will now oppose Sharon in the upcoming March 28th election. Sharons latest medical problems will most likely cost his new party some votes, but with backers from the so called left in that Party,Amir Perez can become our new Prime Minister, a long awaited Labour government…hopefully. Earlier this evening, our Prime Minister was rushed to the hospital in Jerusalem, apparently suffering from a mild stroke. Doctors say that “there was no permanent damage to him”. I wish that was true of the State of Israel. The damage he is responsible for is causing suffering to untold millions. It is too early to say what result this will have on his political life, his damage is done, he has left his trail of blood, he can step down at any time. Whoever takes over for him can glory in his accomplishments of killing the Peace Process in the Middle East. Shimon Peres, the perpetual ‘waiter in the wings’ is at his side as I write this. The irony of a recipient of the Nobel Peace Prize even speaking to a man with so much blood on his hands is incredible. More than 2000 families in the United States will celebrate this Holiday Season with an empty seat at their dinner table. That number represents the number of United States Servicemen that were killed in Iraq, fighting Dubyas “Private War’. 2000 Parents who lost their sons, possibly 2000 children who lost their fathers. For What? Cindy Sheehan has campained non-stop for the war to end, for the troops to be brought home. Her table will be one of those with an empty seat, the seat that should be occupied by her son Casey. But, Casey is dead thanks to Dubya and company. We must all raise our voices with Ms. Sheehan and demand an end to that war NOW. At a meeting recently held in Brooklyn, New York, sponsored by the Brooklyn Parents for Peace, Cindy Sheehan read a poem that was written by her younger daughter. 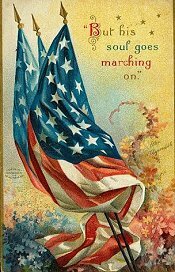 I present it here in memory of her son, and all those that died in vain for no just cause. 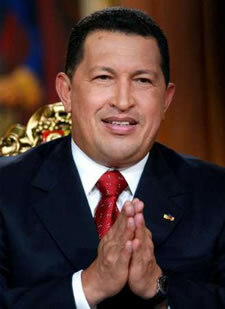 HUGO CHAVEZ… A THORN IN THEIR SIDE? The New York Times always prided itself in their motto…’All The News That’s Fit To Print’… I guess this letter to the editor did not fit, but its a must read. Freedom of the press is a great thing, but readers also must have the right to that freedom. Henry Foner is a name known to the entire ‘Left’ in the United States; he is the former head of the Furriers Union. To ignore his ideas is to ignore history itself. Shame on you New York Times! For years the anti-Semitic elements of the world have denied the truth about the Holocaust. Denied that the nazis were totally incapable of committing such horrendous crimes against humanity. Now, segments of those elements disassociate themslves from such ideologies. Sanctions are called for against Iran due to their presidents’ recent remarks. Those sanctions are welcome, but why now? Why not years ago when Human Rights were violated in that country? Why only Iran?? What about other countries that share those same ideas? Why not Israel itself that is daily violating the Rights of its Arab citizens and the Palestinians. The European Union must open its eyes and ears; yes, Iran deserves sanctions, but they are not the only ones.